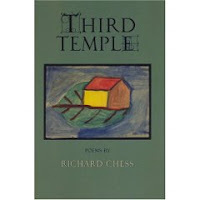 Longtime blog readers already know how much I admire poet Richard Chess. So it’s no surprise that I’m delighted to point you to “Seventy Faces,” which appears today on Poetry Daily. This lovely poem is included in Rick’s new collection, Third Temple, which I’ve just pre-ordered (that TBR pile is just getting bigger all the time, but when Third Temple arrives it will go right to the top).